THE Community Stroke Team based in the Downe Hospital have been highly commended at the recent Care Integration Awards, held in London for improving patient experience and outcomes through a fully integrated hospital outreach and community inreach stroke service in the Downe Hospital. The team is one of twenty winners across a number of illness categories that attracted hundreds of applicants from throughout the UK. Delighted at receiving the high commendation at Downe Stroke Team members Pauline Glenfield (Senior Manager), Hugh Gallagher (Social Worker), Annie Kenny (Occupational Therapist) & Sinead McConnell (Speech and Language Therapist). of illness, prepare patients for discharge, and follow them into their home environment without delay providing community rehabilitation and reintegration. On-going audits and monitoring of outcomes have demonstrated this to be an effective model of care in terms of acute and community length of stay, efficiency and continuity of patient care, rehabilitation outcomes, patient and carer satisfaction, staff feedback and job satisfaction. 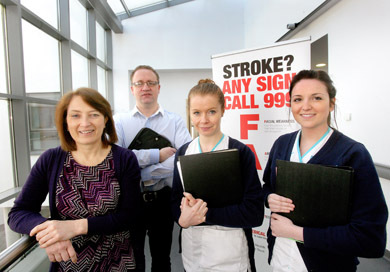 A more recent development which further enhances this truly integrated model of Specialist Stroke Care is the outreach by the ward Stroke Nurses to provide secondary prevention advice and support in the community. Bob Brown, Asst. Director of Nursing and Primary Care, South Eastern HSC Trust said: “The Trust is delighted that our Stroke Team has been recognised at a national UK level for the excellent care provided in hospital and community settings for people who have experienced a stroke. This is a service that has been developing over a number of years during which we have listened to local people affected by stroke. We will continue to strive for excellence in providing care for and support to patients and families in all settings as is the vision of the regional strategy Transforming Your Care”. Alastair McLellan, Editor of Health Service Journal magazine added: “I would like to express our gratitude to the award judges. Their expertise and knowledge reinforces the awards credibility and has helped ensure we have identified the very best from the hundreds of entries we have received”.